Startseite Kontakt Disclaimer Initiative Lesotho e.V. The idea of a high school in Ngodini valley was first proposed by the former Induna, the late Mr Qungisibindi Zungu, who wrote a letter to Good Shepherd Nursing Service asking for financial help IN 1976. It had not yet been approved by the department of Education.After Mr Q. Zungu’s death, in 1985, the Local Development Committee, led by Rev. N. H. Zwane, continued to pursue their former leader’s vision. Mr Muntwani Mdaka donated his field for the school site. Things moved very slowly, and it was only in April 1999 that the Local Development Committee applied for permission to occupy the site. They also approached Mr. B. I. Zungu, Principal of Ezifundeni High School, to release his Deputy Principal, Mr. L. T. Xaba, to head the new school. The school was named Bonga after the present Inkosi, Mr Bonga Mdletshe. It began as a Junior Secondary School, comprising only Grade 8, and was hosted by Makhowe Primary School for the first year, as it had no building of its own. In June 1999 Mr Xaba received a donation of prefabricated building material from Alusaf Smelter at Richards Bay. He and Mr. D. W. Zwane, chairman of the school governing body, each contributed to the cost of transporting the material, which amounted to R 3 000. Mr Xaba gathered volunteers from among the youth of the area and took them to load and unload the material. The hired truck was unable to reach the school site, so the material was off-loaded at the nearby home of Mr. Mathobela, a local businessman. From September to December 1999 Mr Xaba and his colleague Mr. L. M. Nkosi finished classes at noon so that they and the learners could carry the building material from Mathobela’s home to the school site. The local community contributed R 740 towards the construction of the classrooms. Meanwhile Mr Xaba approached Sisters Dity and Marlene of Good Shepherd Institute asking for help with cement and roofing sheets. Three prefabricated classrooms were erected in December 1999. Unfortunately they all collapsed during a storm with gale-force wind. They were quickly reconstructed and we bought extra long bolts to anchor the building. This was successful, the classrooms stood firm until they were eventually demolished in 2008. 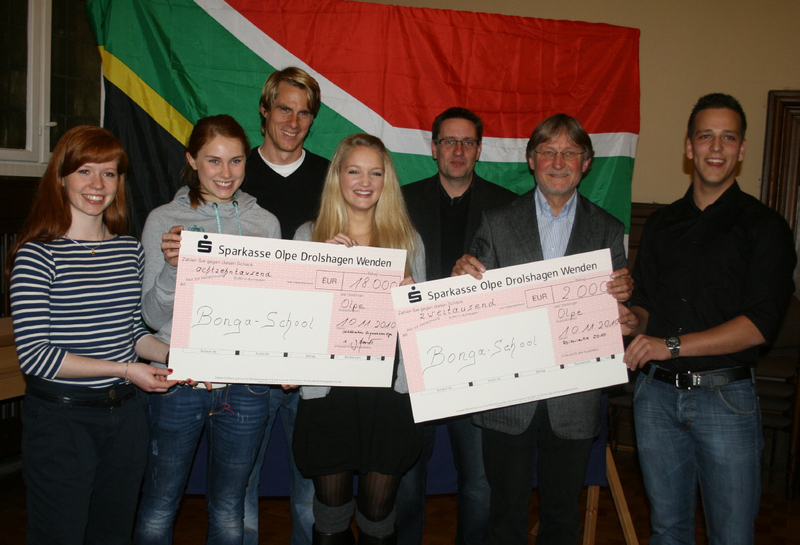 We then had the good news that Dr Gerd Reichenbach and Professor Rainer Andreesen were prepared to help this school. They had both worked in Southern Africa, and on their return to Germany had established a fund (Lesotho Initiative) to assist poor communities. The nursing service had been receiving some funds from them since 1983, to aid the mobile clinic work, and had built several mobile clinic point ‘shelters’ with this help. Now they were willing to help build some classrooms. January 2000 saw the first students already at work in the prefab classrooms. In March 2000 we had a Service of Thanksgiving, and Fr. Thulani Ntsele blessed the building, a joyful occasion for the whole community. It was wonderful, but already overcrowded. We needed more classrooms. Gerd agreed that we could put up 2 permanent classrooms and the work began in April 2000. Mr. M. Zungu was the builder. 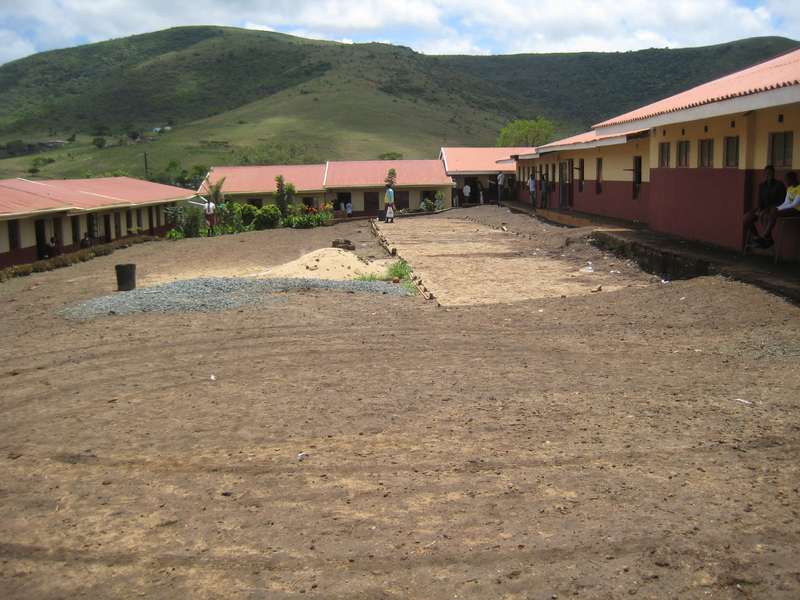 In July 2000 we were already planning more classrooms, and 2 more were built by Mr. B. Mkhwanazi. These classrooms were dedicated to the memory of German Franzen, a teacher who had donated funds for them, and had recently died after a long illness. A memorial plaque was installed on the building in October 2000. By this time we had 3 prefabricated and 4 permanent classrooms, and the school could now accommodate Grades 8 to 10. On 1st December 2000 we had a ‘Grand Opening’ ceremony, with Zulu dancing and singing and speeches from various dignitaries, a very happy occasion. Next, of course, we needed a classroom for Grade 11. But the Department of Education insisted that we would have to have a Science Room before being allowed to progress to Grade 11. After more discussion with our donors overseas, it was decided to go on building, 3 more buildings. This time Mr. M. Mkhwanazi was the builder. For the Science Room we had to employ a carpenter to make special tables, etc, and a plumber to pipe in water and install taps, sinks and drains, and we also had to connect electricity. All of this was ready in time to admit Grade 11 in January 2002, much to the astonishment of the Circuit Manager. Mr. L. Mdluli was commissioned to build a double classroom with a partition that could be opened to use as a hall. 60 desks and benches were also purchased. This was completed in February 2003, and there Bonga’s first Matriculation examinations were written and celebrated in 2003. In 2002 we also had to have a new toilet block built, and a playing field had to be levelled out behind the school. Then a new fence round the whole property. After that, as there was no office for the Principal, or for teachers’ meetings, the School Governing Body decided to use some school funds to build a small Administration Block, comprising just 2 rooms, the Principal’s office and a ‘strong room’, which is prescribed by the Department. The safe for the strong room was another big expense, as was the electricity installation for the new building. In 2005 another classroom was added, and in 2005 to February 2006, a computer room, with extra reinforced ceiling and windows to prevent break-in. Then, early 2006, 26 computers were purchased and installed. Also chairs for the teachers, an overdue necessity. The Administration Block was clearly inadequate, and had to be extended. We were unlucky with the builder we entrusted the work to, and had to struggle. After many worries and frustrations the new Admin Block was finished in 2007, consisting of 12 rooms, including a large staff room, a great relief for the teachers. Then it had to be wired for electricity. Still short of classroom space, in 2007 we had a large double classroom built, with dividing doors in the middle, followed by a library in 2008, all built by Mr. Buthelezi and his team. The original prefab classrooms were demolished in 2008, they had served us well. In 2009 a ‘Sambulo’ wireless telephone was installed. At last we are connected to the outside world. But the Department decided to start supplying food to schools in poor areas, so that students would have at least one meal a day, starting in April 2009. This meant we needed to build a kitchen and fit it out. On 6th May the kitchen was ready, to the great joy of the students, and the cooks, who had been struggling to cook on an open fire outdoors, meals for 700 students every day. Our gratitude goes out to Gerd and Rainer and all the wonderful people in Olpe and elsewhere who have always encouraged and supported us. God will bless them for it. As I write we are in the process of trying to improve the road to the school. When it rains teachers cannot get through the mud. The Government has not given any aid for a road. Now we are waiting anxiously for 2009 Matric results, and to see who will qualify for a bursary for tertiary education: - all with help from our German friends.